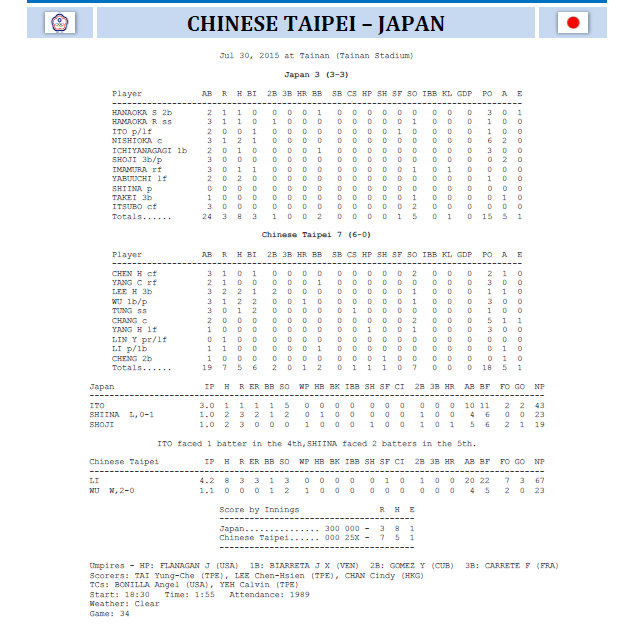 TAINAN, Taiwan – The Chinese Taipei National Team overcome an early scare to defeat arch-rival Japan, 7-3, in the second round to remain undefeated at the 2015 WBSC U-12 Baseball World Cup. Facing a must-win situation, Japan tagged Chinese Taipei’s starting pitcher Li Chou Chang for three runs off of four hits in the top of the first inning. Japan left-handed starting pitcher Naoki Ito (3 IP, 1 H, 1 R) tamed the tournament-leading Chinese Taipei offense to help Japan to keep its world championship hopes alive. Chinese Taipei batters had boasted an astounding .463 batting average heading into Thursday. Chinese Taipei re-energized in the top of the fourth, as Naoki was pulled off the mound. The host nation used a double a walk and a two-RBI single to cut Japan’s lead to 3-2 – at which point the crowd of 2,000 erupted into a chorus of chants and vigorous flag-waving. Chinese Taipei led off the top of the 5th with a hit batsman and a walk, prompting a perfectly placed sacrifice bunt that moved the runners up 90 feet. Then a ground ball with Japan’s infield drawn in was kicked, allowing Chinese Taipei to take a 4-3 lead. With three balls and no strikes Wu Ping-en then put the game away, delivering a long 2-run home run to dead center to put the game away for Chinese Taipei and igniting the crowd into a deafening roar of celebration and musical cheers. 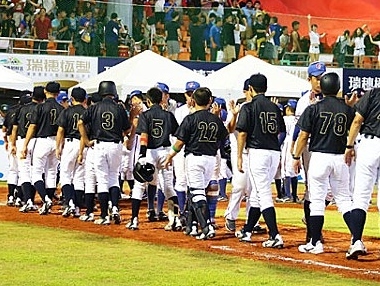 Chinese Taipei (Overall 6-0; Super Round 3-0) will face the United States on Friday at 18:30, in battle of the unbeatens. Earlier on Thursday, Nicaragua defeated Cuba, 4-0, and the U.S. steamrolled Venezuela, 10-2. The top two nations in the Super Group will compete for the U-12 World Championship on Sunday, 2 August at 18:30. In the Consolation Round to determine Nos. 7-12 in the final standings, Australia defeated Russia 10-3, Mexico topped Brazil 7-1 and South Korea beat France 9-3. For the full standings, schedule, 'live' play-by-play, stats, results and box scores of the 2015 WBSC U-12 Baseball World Cup, click here.